We test a works bike that is a peak into the future, straight from the Land of the Rising Sun! While riding new production bikes and the occasional factory bike is just another part of my job, spinning a few laps aboard a true works bike, in Japan, is a true treat. This year, Suzuki's preparing for the launch their first all-new 450 in ten years, and to mark the occasion they invited us to Japan to tour the country, visit their factories, and attend an All-Japan National...plus swing a leg over the 2018 version of their Suzuki RM-Z450WS (Works Special). Click play above to see more of the bike in action and to learn more background on the test. For me, what truly makes the Japanese National works bikes so special is the combination of one-off factory and pre-production parts. These bikes are unique and unobtainable...but at the same time they're a good preview into the future. In this case, I got to ride a bike that's definitely a good hint at what we'll see at dealers in just a few months and after such a long time, it's time for a new Suzuki RM-Z450. Check out the specs below and we'll start to dive into what's special about this machine. 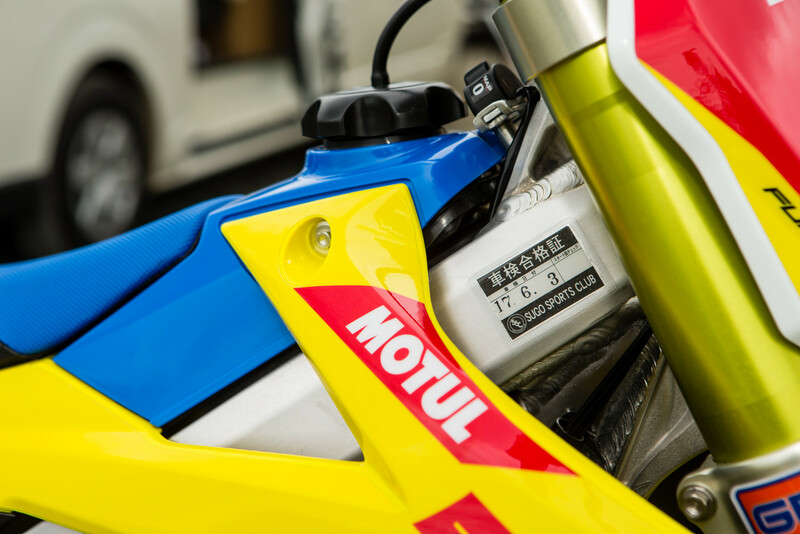 The bike featured here belongs to Suzuki Racing's Kouichi Fukaya, and is one of two entries the team has in the All-Japan IA1 (450) National Motocross Championship. As we've seen in the past, some of the Japanese factory teams use different tires, suspension, and other components among their riders to keep tabs on the development of these brands. In Fukaya's case, his bike featured Showa suspension, Bridgestone tires, and a Magura hydraulic clutch; in place of his teammate's KYB, Dunlop, and manual cable clutch. During our day at the Sugo All-Japan National (check out Pit Bits from this race here), we had some time to take a peek at the two team bikes, but the next day at Fujisawa Raceway was an even better chance to really drool over the machine we'd be riding. We also had access to the team, so I was able to ask a few questions about the bike. But, my answers were limited to ones that didn't involve the production model and didn't dig too deeply into what the specs of the one-off goodies are. Starting down that road, at first glance the bike is obviously the pre-cursor to the '18 production bike we will soon see, and the most obvious changes are the chassis and bodywork. Every piece of plastic on the bike has changed, mostly to work with the new fuel tank, subframe, airbox, etc...along with the new chassis and swingarm. As for these items, we'd have to guess they're pretty darn close to production. Of course, the plastic colors could be different but the main chassis at this point has to be close to what we'll see in a few months. The swingarm and engine mounts may or may not be final production, depending on if the Suzuki team is focused on tailoring the bike to their factory riders or furthering production testing...this answer wasn't available. Also noticeable was the plastic fuel tank, and judging by this we'll guess that the production bike won't be coming with an aluminum tank any longer. From here we know the linkage, triple clamps, and suspension fall into the works category. The suspension, though, could be an interesting tell, as Fukaya's ride was using Showa's 49mm twin-chamber air assist works spring fork and a billet-bodied BFRC shock. We heard earlier this year that only one Japanese brand would have air forks onboard in '18, which the latest KX450F was announced with air, meaning the RM-Z production model will likely have spring come launch time. We'd say it's an even higher chance it'll be similar to Showa's 49mm fork that we saw on the '17 CRF450R. Now out back is interesting as well, as we've seen the BFRC shock in works trim for nearly four years now and we've been hearing rumors of manufacturers testing a production-style one for at least two years...maybe we'll finally see it this year? As for the engine, it appears to have the same center cases as the previous models, but there's obviously some changes for the top end. There's a slightly raised intake angle, a different throttle body (with an underside-mounted injector) which many factory teams have been using, along with a new airbox shape and airboot to feed this machine. Internally things have been massaged, but we weren't privy to what in all that entails. We do know that the fuel is pretty basic, as they can only run pump gas in the All-Japan Nationals. Although, the octane level is a bit higher than what we find here but performance additives are a no-no. Of course beyond all of this are some works/factory Suzuki parts; such as the hardware, footpegs, hubs, brake rotors and the above mentioned linkage and triple clamps...along with stuff like the ECU from MAHLE, Akrapovic exhaust and carbon bits, Hinson clutch, Twin Air, and Dirt Freak. So what stands out about the works bike during the first few laps? Width, weight, and power. Outside of the Yamaha, I'd say the current Suzuki feels the widest purely due to the frame spars, but the '18 works bike has a bit more nimble feel between the legs. No number was given, but the frame spars from the headset down past your knees is definitely a bit slimmer. As for weight, it's a works bike covered in titanium...it's a lovely thing to experience when you pop it off the stand. For a few sprint laps it's not that noticeable, but in the long haul it sure would be nice to have a bike this light. Now for the most impressive thing, the engine...I asked if I could take it home but alas, that wasn't happening. Why? Because, four-speed and endless...endless power. The engine in the RM-Z450WS wasn't the most insane 450 I've ridden, but it's possibly the most usable I've ridden. Between the never-ending mid-to-top pull and works four-speed transmission, I hardly ever had to shift. Honestly, second and third did the work everywhere and fourth would only be needed on the fastest of tracks. Down low, the engine was as crisp as any race engine I've tried and it revved up quicker off the snap of the throttle quicker than a stock RM-Z, but then chugged down and pulled in what felt like the never-ending mid-range. If I wanted to break past that initial smooth pull and dive right into that insane mid-range, a simple snap of what felt like a very aggressive clutch but coupled to a buttery-smooth Magura hydraulic unit would do the trick. Honestly, engagement of this unit was a little late in the lever pull, but that was quick to get used to. Now off the throttle was just as responsive, as I'd have to guess the crank's been lightened up a bit...due to a bit less engine braking than stock. But, it was just enough to help bring things to a stop in the tighter sections. Now back to the chassis, as this is the main point of the bike that should be fairly close to the production bike we'll soon be on. I already mentioned it was slimmer-feeling, but what about the handling characteristics? The RM-Z is already known for its turning prowess, so what's the gain? I noticed an overall better balance through the bike and while the bike has a bit more front-end bias (due to the addition of spring forks) I'd swear the opposite when riding it. The RM-Z450WS rivals the outgoing machine in the tight stuff, but is much easier to handle when sweeping long corners, especially when under power. Overall the biggest difference I noticed is how much easier it tracks out of a long corner, not wanting to stand up and oversteer on exit. It doesn't push per-se, but it just flows with the corner with less input than I'm used to with the big-bore Suzuki four-stroke. As for the suspension...it sure is trick! While it does have Showa's works twin-chamber spring fork with air assist, I found that Fukaya's setting isn't utilizing the air assist, keeping the pressure to zero. This is quite common amongst the pros I've asked that have these forks, as only a few have settled on using a small amount of pressure to increase the bottoming resistance. As for the action; they were quite plush in the mid-stroke and had great bottoming resistance at my weight, but were a bit too stiff initially for my taste. Of course, they're set up and tested specifically for one guy, the man paid to race this machine. Out back is the BFRC shock, and it's one of the most unique items that very few have ridden with so far. While it's quite popular in the GPs and in Japan, it's not too common in the US racing scene yet. Due to a very free feeling mid-stroke and rebound feel, it hasn't quite won over the U.S. riders that like a bit stiffer and dead-feeling rear end. But, this overall "liveliness" is quite the pleasure to use when the track is choppy and is constantly sweeping through corners....due to the rear tire being able to constantly find the ground and with that some extra traction. Though, this comes with adjusting to a bit more movement everywhere and can cause a feeling of unbalance if the forks don't quite match the amount of movement. In the end, we have a few more weeks to wait for the 2018 RM-Z450 production bike to be unveiled, but this test was a cool chance to find out a few things about the new machine while also seeing what the riders in the Land of the Rising Sun get to race with. Even when this bike becomes toned down for production, we can still surmise that it's going the right direction. US sales of the 05-07 RMZ450 suffered with the 4 speed. The 5 speed appeals to the American market, which uses 450's for more than MX. I'd be surprised to see a 4 speed. I also liked the 06 kx 450 with the 4speed better than the 07 with the 5speed.! The 06 rmz was a better bike though 100%. I'm American and I'm all for the four speed on the z model. Rmx 450 with the 5 speed would be cool. Any ideas when the 18's are going to be released? My 06 rmz with the 4 speed and a pipe was my favorite 450 engine ever! That thing was so easy to go fast on. I will really consider one of these if they have a 4 speed again.